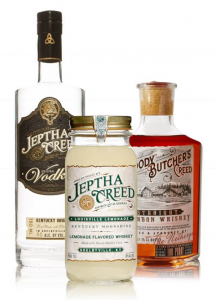 Jeptha Creed Distillery was a means to keep the Nethery Farm going, a continuation of their family heritage that’s been going strong since the 1700s. The biggest distilleries in the country were once family-owned enterprises and the only difference between Jeptha Creed and them is that they want to remain a family-owned, authentic enterprise. The distillery is owned and operated by a mother-daughter duo, Joyce and Autumn Nethery. The family’s 64-acre distillery sits on approximately 1,000 acres of land where they produce almost all the products used to make their spirits. The Nethery family is committed to their ground to glass motto, if they can grow the products themselves, they will. Using only the finest, locally grown and sourced ingredients ensures their products meet the highest expectations for quality and flavor. Not only do they produce their own corn and fruits, they use old-fashioned methods to meet today’s demanding modern tastes. “Ne Oublie” is a Scottish Gaelic saying meaning “Never Forget”. Much like their use of old-fashioned methods, this phrase has been passed down through the Nethery family for generations. Jeptha Creed was founded on the motto “Don’t forget where you came from,” and they hold true to that to this day. The distillery currently has their Vodka and Moonshine on the market and their bourbon is aging and will be available in 2019! Unfortunately, Jeptha Creed spirits are not available in Indianapolis, but they will be available to taste at Indy’s Premier Bourbon Celebration on February 23, 2018. Get your tickets here!